I am so glad that I read about Context Travel's walking tours in Arthur Frommer's syndicated newspaper travel column that was carried, in my case, in the travel section of the Palm Beach Post. Dr. Alex Goldfeld was a very personable guide who had the expertise to factually answer any question that came up within our group of seven guests. 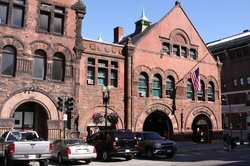 During a wonderful, fact-filled trip through Boston's North End, Dr. Goldfeld's expertise perhaps shone through best inside the Old North Church/Christ Church and at Copp's Hill Burying Ground, where he shared his knowledge from heritage and his studies to reveal things that no other casual visitors walked away knowing. 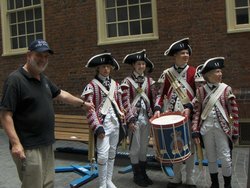 At the Old North Church, Dr. Goldfeld explained far more than the docent at the lectern, as part of the price of admission, was able to tell us. Dr. Goldfeld ably addressed the history and evolution of Boston's North End from its original English inhabitants through the Irish influx and its current role as the Little Italy of Boston, a late heritage that has lasted for the past 100 years. Personal Magic for Me: Were it not for Dr. Goldfeld's tour, I would have not discovered the Green Dragon Tavern. The oft-written-about Union Oyster House will serve you six shucked oysters for an outrageous $16. Right around the corner, an immediate right turn down the next alley, beckons the Green Dragon Tavern, which also boasts as a place where the Sons...I am so glad that I read about Context Travel's walking tours in Arthur Frommer's syndicated newspaper travel column that was carried, in my case, in the travel section of the Palm Beach Post. Dr. Alex Goldfeld was a very personable guide who had the expertise to factually answer any question that came up within our group of seven guests. 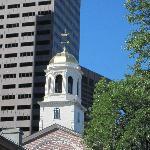 During a wonderful, fact-filled trip through Boston's North End, Dr. Goldfeld's expertise perhaps shone through best inside the Old North Church/Christ Church and at Copp's Hill Burying Ground, where he shared his knowledge from heritage and his studies to reveal things that no other casual visitors walked away knowing. At the Old North Church, Dr. Goldfeld explained far more than the docent at the lectern, as part of the price of admission, was able to tell us. Dr. Goldfeld ably addressed the history and evolution of Boston's North End from its original English inhabitants through the Irish influx and its current role as the Little Italy of Boston, a late heritage that has lasted for the past 100 years. Personal Magic for Me: Were it not for Dr. Goldfeld's tour, I would have not discovered the Green Dragon Tavern. 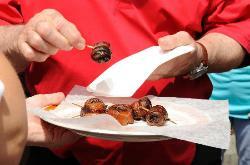 The oft-written-about Union Oyster House will serve you six shucked oysters for an outrageous $16. Right around the corner, an immediate right turn down the next alley, beckons the Green Dragon Tavern, which also boasts as a place where the Sons of Liberty met. Having a meal in a place where the Sons of LIberty met was an item on my bucket list. Nearly as cool, an entire lobster dinner at the Green Dragon Tavern was only $13.50 with two sides. Adding a gin and tonic, the total tab was around $20... remarkable for a Boston experience. I highly recommend Context tours. We took one Context tour in Rome which was outstanding. I proceeded to break my foot in Rome (NOT on the Context tour!) and so Context allowed us to take another tour with them one and a half years later (this time in Boston). I appreciate Context's customer service and I also appreciate their outstanding, highly educated and passionate tour guides. Both of our Context guides -- in Rome and in Boston -- managed to make three hours fly by by bringing history to life. If you can take a Context tour anywhere, go for it! So glad you loved the walking seminar in Boston. It's one of our newest cities (only a year old) but one of our favorites. The Rome of the United States, one might say, in terms of the layers of history. Glad your foot is better, too. Keep in touch. 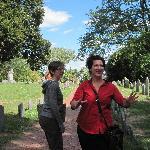 Jessica from Context Tours guided us through the Irish famine, past Uncle Tom Cabin's publisher's digs, the scull and crossbone tombstones next to Paul Revere's tomb and so much more. She's a walking story teller of the trials and tribulations of the Tea Party, the Massacre, and Washington's school years at the same school she attended. 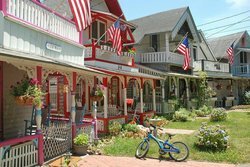 She lives and breaths the history of her home town. 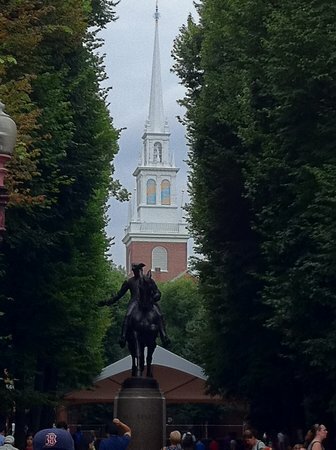 The Beacon Hill tour was really interesting as much for the information on the big, beautiful and beautifully designed 18th and 19th century housing and streets as the walk through the back alleys, low slung doors, hidden gardens and walls which aren't walls. And at the end she pointed us to a wonderfully busy and very good food cafe that the locals frequent. We took the tour which was led by Jessica Dello Russo. Jessica is a Boston native with a degree in architecture and graduate work at Harvard and overseas. 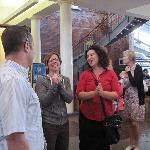 She was an engaging guide with an extensive knowledge of the sites and players that made Boston history so compelling. 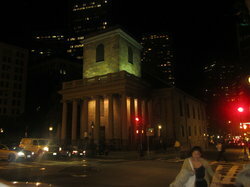 We visited King's Chapel, the Granery Burial Ground and the Boston Atheneum along with other interesting sites. 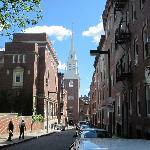 The stroll through the quaint streets of Beacon Hill was perhaps the most fun of all!